Moving is among the best, and also the worst experiences I’ve ever faced. On the one hand, we get to move into a new place! A better place! A place that belongs to us! On the other hand, you do have to actually move all your stuff and then your landlords charge you $50 because you need 20 minutes extra to finish cleaning out your fridge so you can check out, and then they don’t give you any of your $300 deposit back because, I dunno, they need to clean the carpet in the bedroom or patch a few nail holes in the walls. Good riddance foul Slum Lords of Provo! But I diverge. There was a period of about five years during college when everything I owned would fit into my little car. I’m pretty sure everything Aaron owned would have fit into his backpack, but then we got married and all our stuff must have gotten together and had babies because we now have so. much. stuff. You don’t ever feel like you have that much until you have to relocate everything and then you realize that your furniture and nice dishes, and all that childhood memorabilia your parents give you every time you see them (I know I still have some boxes in the garage, Mom) has added up and there are now several truck loads of stuff that belongs to you just waiting to be carried somewhere new. Moving is, however, the most efficient way to discover which of your possessions you love and which you could live without. Where previously you might have thought, but I really like those shoes! I know I’m going to wear them again sometime! They cost a fortune! When you see the seventy pounds of shoes at your feet and think about boxing them up, carrying that box down three flights of stairs, putting it into a truck, carrying it into a new place and then unpacking it and finding it a new home, you discover very quickly the things you really care about. There was even a time when we decided to just leave our couch behind because the prospect of moving that behemoth monster around the twisting staircase (we almost dropped it over the rail when we moved in) was far worse than inviting all our company to sit on the floor in our living room for the next few years. It was really only through the extreme persuasion of my siblings that this would not be a good idea socially, that Aaron was willing to give it a try. It took five people to get the job done. Five. Anyway, we got moved in. Right after we officially changed our place of residence, Aaron left on a work trip to the Philippines for a few weeks so the “construction” type work got put on hold because trim and new doors is not something I can do myself. Instead I set to unpacking our stuff and doing a few other small projects. 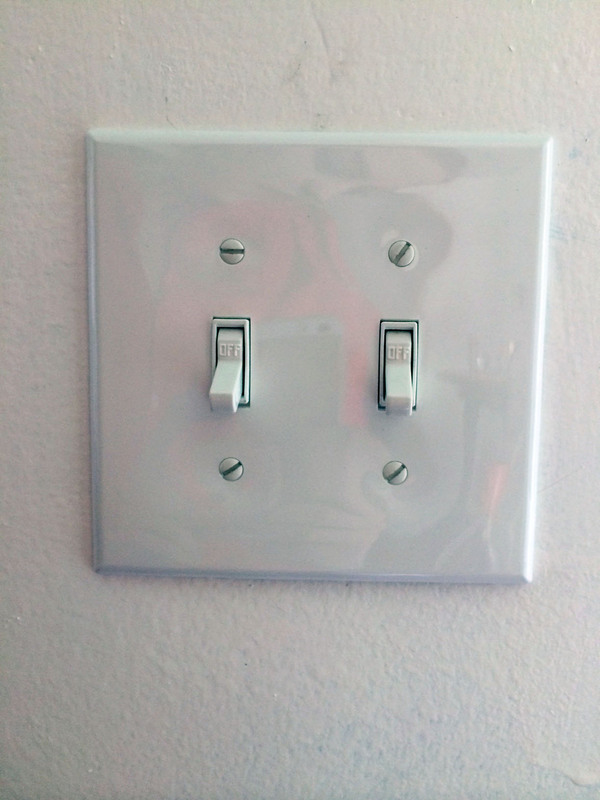 One of these was changing out all our light switches. 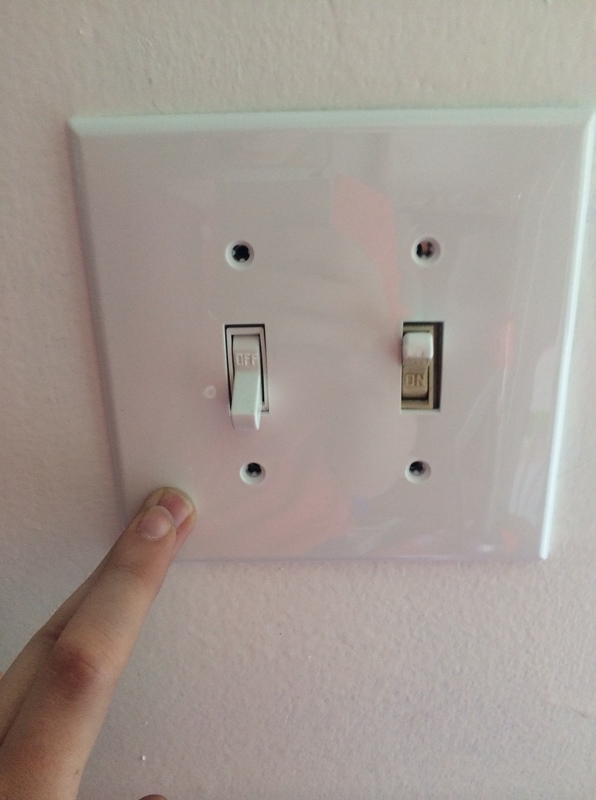 We tossed all the old beige plates when we painted and got new white ones, but the switches themselves were bandaid beige still and looked weird with the new white plates. This was a bit of an intimidating task because, I mean, it’s electrical work! I spent about an hour Googling how to do it and made my sister come over to my house in case I accidentally electrocuted myself I wouldn’t just be left to die alone, but then I actually did it and found it was cake. 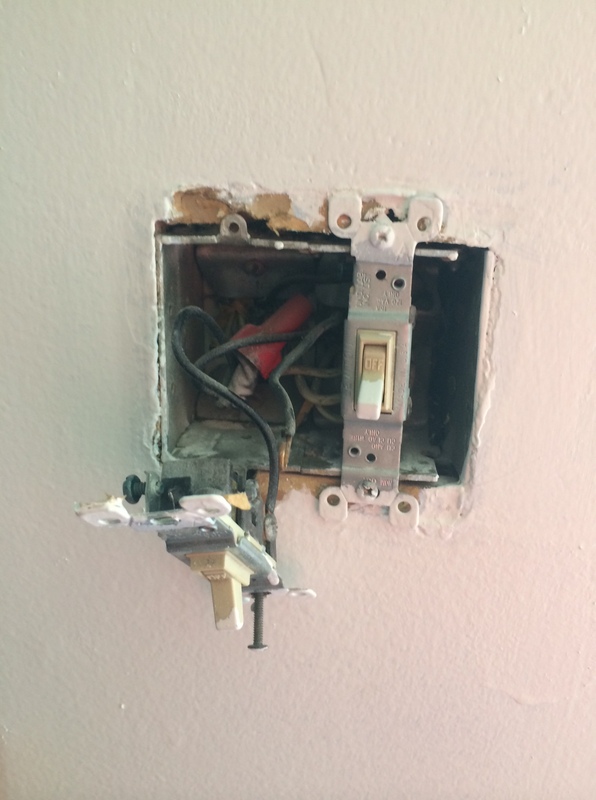 Turn off the power, unscrew the old switch, remove the two wires, put the wires on the new switch, screw it in. I’m a regular old Bob the Builder. The old and new switches in the new plate. 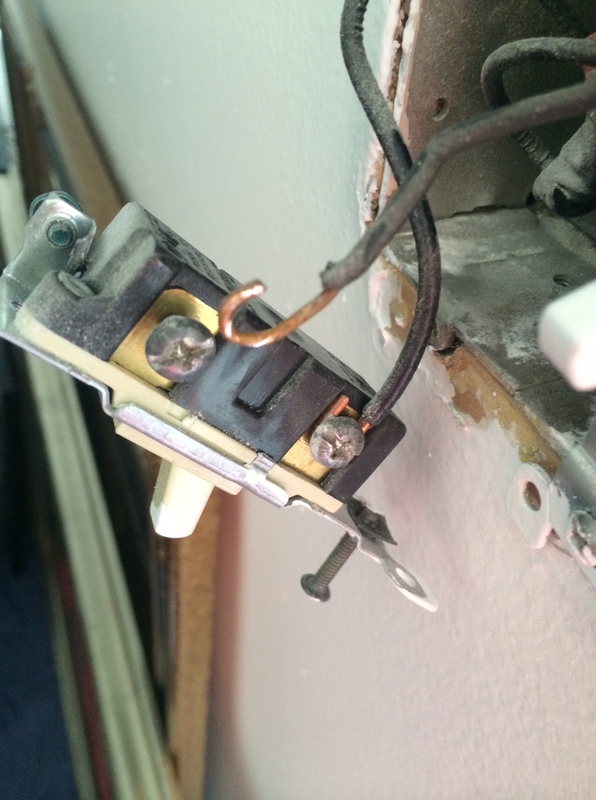 Remove the wires from the screws on the side of the switch.